When vaccuuming your hardwood floors, remember to turn off the beater bar… and smile! You can protect your new hardwood floor by following these easy guidelines. Use rugs at workstations, pivot-points (e.g., stair landings, room entries), and high-traffic areas to reduce wear, especially if you have a large family or indoor pets. Use mats at all exterior doors to keep sand, dirt, grit, grease, and oil outside. Keep pets’ nails trimmed and paws clean and free of dirt. Place protective pads beneath furniture legs and feet to reduce scratches and dents. Exposure to the sun and its UV rays accelerates the oxidation and aging of wood and fabrics. This causes the stain and/or wood to fade and/or change color. We recommend you rearrange rugs and furniture periodically so the floor ages evenly. Hardwood floor warranties do not cover damage from the sun and UV rays. 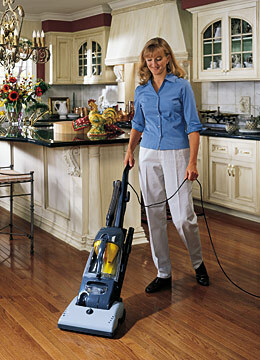 Sweep or vacuum regularly, since built-up grit can damage the finish. The vacuum head must be a soft brush or felt type. Be certain the wheels of the vacuum are clean and do not damage the flooring. Do not use a vacuum with a beater bar head. Important: Never wet mop or flood your floor with water or other products. This can severely damage the floor.